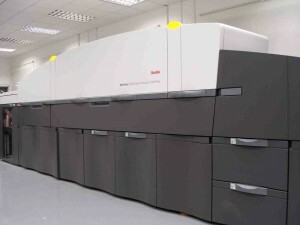 A NexPress digital offset printing machine has been ordered from Kodak. The £250,000 4 tonne press will be installed and running before the end of November. It will compliment the existing Heidelberg digital and litho presses and will round off a year that has seen the most investment ever in the company’s history. Capacity will rise significantly, although some of this is already expected to be filled from the company’s burgeoning web2print business. Sales and marketing director Kelly Harris adds, “Perhaps more exciting for our creative customers is that the press can produce some really cool and striking effects inline – this is a further differentiator when compared with the other quality digital presses out there. Initially we will be able to offer a gloss or matt coating and so called Dimensional Printing where we can actually apply relief to an image to increase its impact.” Other inline products coming soon will be metallics and fluorescents, the former unique in the digital market. Together with powerful variable page composition software it will be possible to use these effects in just the same way as traditional ink to create highly bespoke and personalised printed items.